Ant!pode is delighted to inform GOD YOHOGOI by Sergey Potapov (fictioned documentary, 60 min. 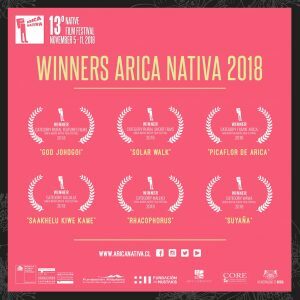 Russia, 2016) has won 1st Prize /RURAL CATEGORY FEATURE FILMS at 13TH NATIVE FILM FESTIVAL ARICA NATIVA 2018 (November, 5-11, Chile). The film was included in programmes NATIVe – Indigenous Cinema (Berlinale 2017), First Peoples’ Festival PRÉSENCE (Canada, MONTRÉAL 2017), Border Crossings’ ORIGINS Festival (London, 2017).